The 4 Port SATA3 RAID PCIe Cards High transfer rate is supported up to 1,000MB/S (2 lanes) for large imaging data file applications with the CG-PCIeS3-i4p. Breaking the bottleneck and extending the bandwidth while supporting HyperDuo modes is a great feature in this PCIe Card. 4 SATA3 ports which fully support devices up to 6.0Gb/s data transfer rate. High transfer rate is supported by the 4 Port SATA3 RAID PCIe card up to 1,000MB/S. Supports Hot-Plug and Hot-Swap Features. Supports two double-deck (4 ports total) internal SATA connectors. 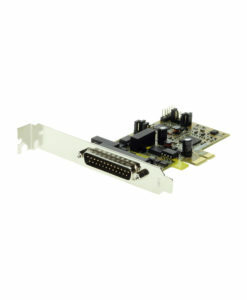 The CG-PCIeS3-i4p 4 Port SATA3 RAID PCI Express card provides a scalable, high-speed, serial I/O bus that maintains backward compatibility with PCI applications and drivers. Its architecture defines a high-performance, point-to-point, scalable, serial bus at speed of 500Mbytes/sec to 4GBytes/sec (and 8Gbytes/sec in the future). Supports Hot-Plug and Hot-Swap Features.Supports Port Multiplier Based on FIS Switching.